What we’ve got here is an absolute must-have traveler’s companion app for iPhone and iPad that you’ll definitely want to take with you if you’re thinking of visiting Spain or any Spanish-speaking countries this year. It comes complete with a translation dictionary, phrase book, and lots more to help you get by. This is definitely one of the better apps of its kind that I’ve seen in this kind of price range, and I think it is very likely to serve you wonderfully if you know little-to-no Spanish. The interface features a very generic design which, although not very imaginative on the part of the developer, definitely makes for a simpler user-experience and makes it a little easier to navigate the various features. Spanish English Dictionary + contains a comprehensive Spanish to English Dictionary with more than half a million different entries made of up usage examples, slang, idioms, and masculine and feminine forms for Spanish nouns. One feature I found to be quite original, and one that I haven’t come across in other apps, is that you can add not only your own notes to dictionary entries, but also images and audio clips. This is a great way of adding in relevant photos to nouns and your own attempts at pronunciation. There is also a phrase book which features over 500 different phrases in Spanish and English spanning 20 different categories, including things like Greetings, Transportation, Accommodation, and Eating Out. This should provide everything you need if you’re just going on vacation for a week or two. What’s more, there are also some highly effective vocabulary quizzes in Spanish or English which include a scoring system so that you can test yourself and track your progress over time to ensure your skills continue to develop. 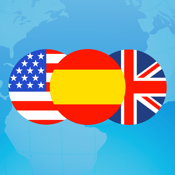 Spanish English Dictionary + is a very well-featured iPhone and iPad app that is sure to be a powerful asset to any traveler, or simply to any of you who are serious about learning Spanish but aren’t really too sure where to start.